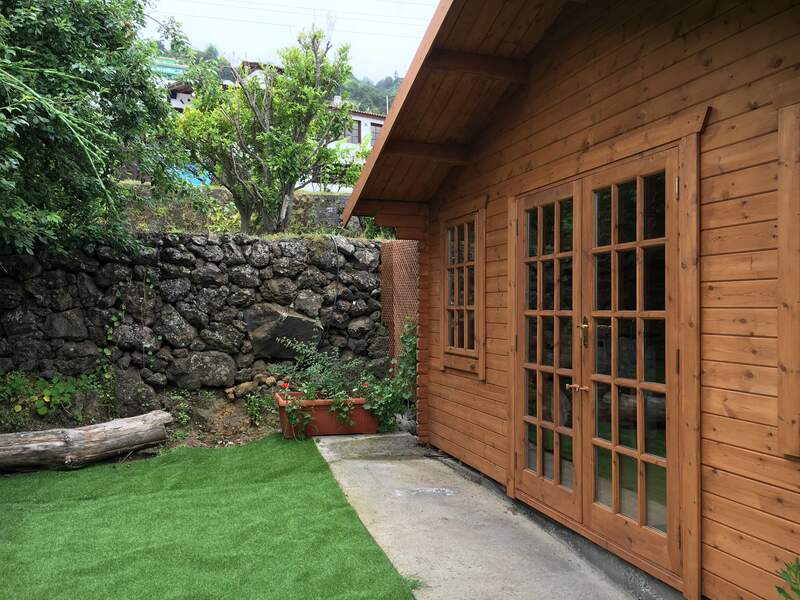 Welcome to the latest addition to our rental properties situated in a private area on our Canarian Finca, in the beautiful village of La Perdoma, part of the La Orotava valley, North of Tenerife. The cabin is made from good quality Scandinavian Pine and designed in the UK, imported and constructed by our own fair hands. It has a large 2 bedroom design with an entrance through double French doors into an open plan lounge, kitchen and dining area. The lounge is a very comfortable with beautiful views to the coastline of Puerto De La Cruz and the surrounding La Orotava Valley. It has a comfortable reclining leather settee and armchair, relaxed lighting, TV with satellite UK channels, DVD player, radio and CD player. The kitchen is fully equipped, with modern appliances, oven, hob, fridge, washing machine, microwave, toaster, coffee maker, iron, crockery and utensils. The spacious dining area is situated alongside the kitchen with views to the garden. The log cabin has 2 large double bedrooms , both have an entrance into a beautiful en suite bathroom. The master bedroom has a comfortable large double bed with pine furniture which includes wardrobe, dressing table with mirror, bedside lamp and hairdryer. The second bedroom has a double bed, wardrobe and dressing table. The large, modern bathroom contains a luxury power shower with constant hot water (very much appreciated after a day out walking in the surrounding countryside). Outside the french doors there is a private garden area with table, chairs and sun loungers. There is also a well established garden with lawn, fruit trees (pick your own), plants and flowers. All linen and towels provided and changed weekly. Free WiFi throughout. Off road parking.